Early in 2009, while the country was swept up in talk of bailing out banks and saving our national bacon, I was on vacation out in the sunny Southwest, sending pictures on email and Facebook to my friends and workmates back in chilly Mount Airy, North Carolina. I had a great job, working with disadvantaged people (adults with intellectual disabilities) and was feeling, let’s face it, pretty dang good about life. Until I got home. The Monday I returned to work, I got the dreaded “pink slip.” Not sure why it has that nomenclature—in my case it wasn’t pink, but came in the form of a short, impersonal letter. It was a total body slam—I had excellent employee ratings, I loved my job, everyone liked me. But. The company was downsizing, and some people, including me, Just Had to Go. A lot happened then, in a very short time. I guess I went into a grief state, and quickly, or simultaneously, into Survival Mode. I began applying for every job I could envision myself taking. The unwritten rule has always been, “don’t apply for a job you don’t want”—but in a small community with few—and rapidly dwindling—opportunities, that was a tough one to follow. I had a niche—counseling, caring, organizing for, and assisting people in need—but that meant that I saw the same employers in a three-county rural area over and over again, with the same resume in hand. It very quickly became humiliating. Cutting to the chase, I got a job four months later. I passed a rigorous interview process and was hired, with federal recovery funds, to work as a Career Facilitator in the Job Link offices in our area. It was envisioned as a temporary position, and it was part time. Now, four and a half years later, I’m still in this job, fulltime; and after working as far as an hour from home, and in five different offices, I’m within walking distance of my house half the week. I am back helping disadvantaged people, people I could sure identify with; that empathy helps me every day and keeps me on track. But. I don’t crow about my success to my clients. I know where they are, and I count myself lucky to be where I am. The folks I assist have been out of work for two years or more in some cases, are drifting from temporary job to temporary job, need to be retrained, and are still in shock from the loss of long-term employment (like mill and factory work) that seemed like it would never end. As I got to know my community from their perspective, I saw a picture emerging. A picture of a culture. Mayberry, as Mount Airy is sometimes referred to, my hometown of the past seven years, once had thriving textile mills. The midsection of the town is now full of big, multi-story buildings that once housed workers and humming machinery running 24/7. 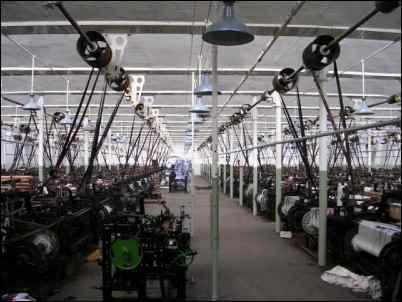 That all started to die in the early 2000s, and people who had worked in textile mills all their adult lives were devastated. It wasn’t just the statistics—in 2009-10 the unemployment rate in the county was 11-12 percent—but the real toll on people’s lives, both economic and psychological. What was lost in the shuffle—and I’m skipping over the politics because nobody on either side seems to have all the answers—what was lost in the shuffle was CULTURE. In a small town where a majority of people worked in two or three large industries, there had been cohesion. There were good jobs that gave young people a reason to stay in little “hick” towns, and there were all sorts of hidden benefits. Tough as “production” work was, it had an incentive built in: the harder you worked, the better your pay. Your family worked in the same place. You saw your best friends every day and had commonality of interest with all of them. You met your sweetheart at work, and flirted in the break room. You anticipated that your kids would get jobs in the mill just like you did. Continuity and cohesion of local culture was strained, frayed, and finally torn apart when economic shifts dumped everyone out on the streets. People, especially young people, left the little burgs, the Mayberrys, never, probably, to return. The downtowns of America became unrecoverable ghost villages. A few years ago, I read Linthead Stomp: The Creation of Country Music in the Piedmont South (Patrick Huber. University of North Carolina Press), a book that examines both the cultural advantages the South enjoyed when looms were humming, and the implications of the loss that was subtle but real when the mills shut down. A neighbor who used to do maintenance in one of the large local mills told me that once he was called in to repair the wooden floor where “a little old lady had sat at the same sewing machine for fifty years, and when she left they saw she’d worn the floor down two or three inches where her chair used to be.” That is Tradition. ‘Twelve dollars a week is all we get, how in the heck can we live on that? Almost every day as a Career Facilitator I talk to someone who was permanently impacted by the loss of this major source of what used to seem like forever employment, and the loss of the cultural hub that such shared work affords a community. The music that runs through Huber’s book is still heard here formally and informally—strains of old time and bluegrass clash and mix throughout the region with many famous musicians (Tommy Jarrell, Charlie Poole, Richard Bowman, Donnie “Dobro” Scott) hailing from this area. Most everyone in this region plays an acoustic instrument or has a close friend or relative who does. The fracturing of the culture when the mills shut down did not stop the music, but, for a time, as noted by Huber, it limited its flow. There’s still a yearly fiddler’s convention here that draws thousands of pickers, from far away and near, to the Veterans Park, and local groups with names like the “Toast String Stretchers” and the “Pilot Mountain Bobcats” compete for prizes. We all know these stories or some like them; my job loss, the town’s job and people loss, and added to it all, a continuing slow drag of times that are, if not hard like as during the Great Depression, are certainly challenging. 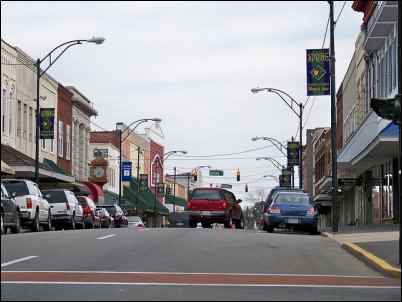 Mount Airy, North Carolina (the town name exists in several states) was fortunate, very, in finding itself on television. Sort of. That is, it was a possible candidate for the rights to the Mayberry “brand” that came from its off-camera association with the enormously popular, and still very much alive, Andy Griffith Show. The show ran from 1960 to 1968, with 249 episodes and is probably on the air somewhere in the world as you read this. Andy grew up here. In his mind, and in the mind of many locals, under the TV hype and the hick yucks, Mt. Airy was what Mayberry was like, and Mayberry had a lot of good stuff going on. 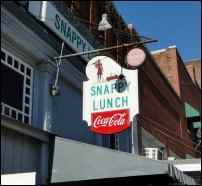 Accepting the mantle of small-town family values that go with the Mayberry title, this village where Andy whistled up the streets, site of Floyd’s Barber Shop and Snappy Lunch, began recreating itself in 1990 as the idyllic TV town. This transformation has had one major, long-term effect, possibly to the surprise of even the town officials and boosters who cleverly crafted it. Different from most every other small town in our region, along the three central blocks of Main Street in Mt. Airy there are no closed stores, no boarded up abandoned enterprises. 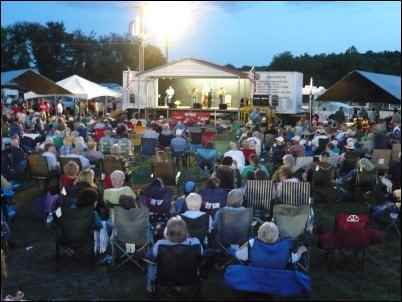 Mayberry Days, a yearly festival, attracts thousands of visitors. People from farther away, Americans looking for those old-fashioned virtues that were expressed, as they see it, on the Andy Griffith Show, have rolled into Mt. Airy on tour buses, to ride in Barney and Andy’s black-and-white; get locked in the little jail tricked out to look like the screen version; visit the school he attended (now a museum and theater); and see, or even stay the night, in the house where Andy lived as a child. The subtle machinations of Mt. Airy’s transformation into Mayberry will probably never be known, and questions will always crop up. “Mabry” is a local place name; there’s an old mill up along the Blue Ridge Parkway with that name where tourists can see what a mill race and a millstone looked like. “Mayberry” is actually a real town in nearby Virginia, but Griffith surely didn’t get the Mayberry idea from there; he was a North Carolinian to the core, setting his later TV series, Matlock, in Wilmington, where he got his start in the folk theater, and lived in his later years. To confuse things further, Andy Griffith himself said that his model for Mayberry was Pilot Mountain, a tiny town near Mt. Airy with a highly recognized knob-hill that sits over the Piedmont plains. Somehow, “Mt. Pilot” as it is referred to in the TV shows, lost out to the larger and possibly slightly more prosperous Mt. Airy in the Mayberry branding sweepstakes. It was winner-take-all, and the rewards, if current Mayberry business is any indication, were worth the effort. But the bigger question is why (and whether) Mayberry-type values persist, here or anywhere, and what that means for us (homesteaders, eco-visionaries, small-holders, back-to-the-landers). Homesteading in modern times (since the 1940s) has rarely been an out-right, do-or-die necessity for anyone who undertook it, but has instead another allure: it harks back to what seem like, and almost certainly were, “simpler” times. The quest for simplicity, for calm, for clear-cut work and reward, for more direct connection between who we are and what we do and what we eat and how we raise our kids, is a high calling. Part of what calls us is just what Mt. Airy and other American towns (and some big cities) have lost and are trying to rebuild: family and community cohesion. 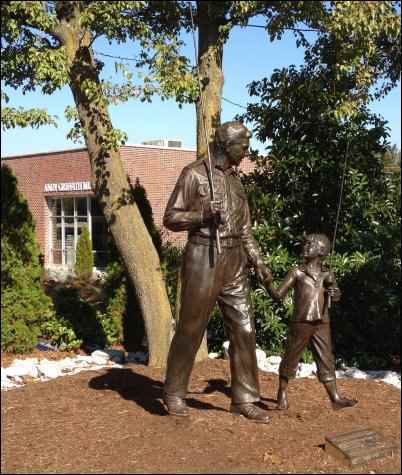 Now, “Mayberry” becomes not a town, real or fictional, but a symbol for what is possible and what should be. Mayberry values, as promulgated week after week on The Andy Griffith Show, include the willingness to: understand and tolerate difference; raise children with equal amounts of discipline and love; respect the law but not take it to overbearing and oppressive extremes; respect elders; give meaningful work to everyone who wants it; allow women to work and have authority; and laugh at ourselves. The cast and writers of the show conveyed all this without any particular emphasis on religion, politics, or current events. Mayberry existed, and still exists, outside time and place; it’s only Southern by accident and could as easily be plunked down in Iowa, Michigan, yessir, even California. In the time we’ve lived in Mayberry, we’ve noted a down-home friendliness that pervades the dealings of ordinary people. There’s crime here, but so much less than in neighboring regions that Mexicans seeking a better lives for their offspring choose our area over others. 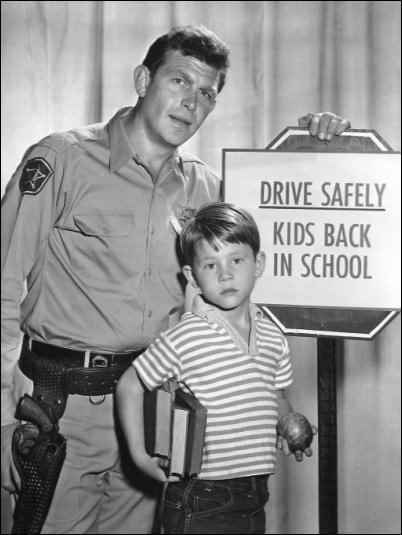 Mayberry values seem to include a “live and let live” ethos. Our neighborhood is currently tri-racial, and all the houses, no matter who occupies them now, were built to house millworkers along the lower edge of the town. With everyone poor, it’s hard to generate much class resentment. In the real town of Mount Airy right now, problems abound as elsewhere, with a jobless rate that still is not statistically satisfactory, not having fallen much since 2009. Some believe that as the major and minor stars of the show die off (they’re all about gone now), the attractions of Mayberry-ness will not hold up. The next few years will tell that tale. If tourism begins to take a plunge, then Mayberry will have to rebirth itself yet again—some say wine, ironically, will be the saving grace of the local region where many vineyards began to spring up around the same time as Mayberry came to people’s attention as a family-oriented, educational, musical vacation place. The Chamber of Commerce is trying out the “Mayberry Merlot” linkage, potentially turning the town into a place more favored by Otis Campbell than by the law-abiding Sheriff Taylor and his oh-so-proper Aunt Bea. So what is the “real” Mayberry’s potential for the future renewal of cultural cohesion? It’s possible to speculate that there is a new utopian Mayberry emerging out of the marriage between the made-up fantasy town and the real place: a Mayberry of the mind, a Mayberry seen, as in that Denver Post article, as a symbol of shared ideals generated by true tolerance, a fertile seedbed for new idealism with the power to unite us.